That thunderbolt of an idea put him on the road towards creating some of the most unsettling and surreal images in cinema from the dancing dream dwarf in Twin Peaks to those freaky little people in Mulholland Drive. His first step was the multimedia work “Six Men Getting Sick” – a large-scale work consisting of painting, sculpture and a one-minute film loop, Lynch’s first foray into film. His subsequent early film work, from The Grandmother to Eraserhead, feels like an extension of his fine art work. “As a painter, you do everything yourself, and I thought cinema was that way,” Lynch said, “like a painting, but you have people helping you.” Of course, by the time he made his big budget dud Dune, he was thoroughly disabused of that notion. Yet while becoming one of Hollywood’s most influential directors, he continued to paint. 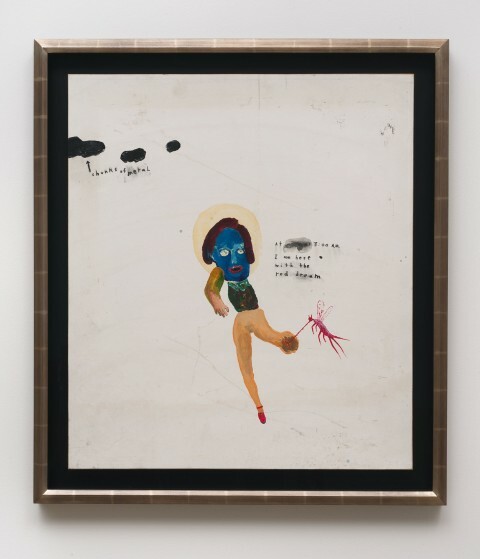 Last year his alma mater unveiled a retrospective of his artwork from 1965 to the present called “David Lynch: The Unified Field.” Much of the work is from the late-90s on, a time when Lynch found himself detaching more and more from Hollywood. His last feature film, Inland Empire, came out in 2006. Apparently, he was spending much of his free time in the studio. His work during this period is intentionally crude and childlike, combining cartoonish images with pregnant, semi-intelligible text. Sure, his paintings don’t have the primal, psychosexual power of his movies, but there is still something compelling about them. Take, for insistence, the multimedia work “I Burn Pinecone and throw it in your house” (top). It looks like a demented children’s book narrated by a crazed mountain man. “At 3 A.M. I Am Here With The Red Dream” (middle) looks like the product of a mental patient, complete with smudged out text and Henry Darger-esque girl legs. Of course, Lynch didn’t restrict himself to painting. He has also worked in digital photography. 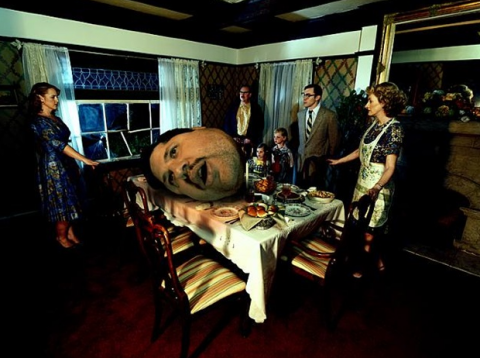 In his 2009 work, Untitled (Grim Augury #1), (bottom) Lynch depicts a Sunday dinner gone horribly, inexplicably, wrong. You can watch a video of the exhibit below. 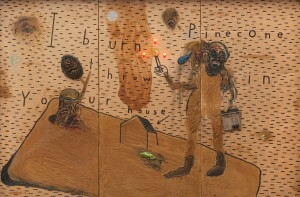 Find an online gallery of Lynch's artistic works here.